"It is coming together," said a happy Jade Matthews after the barnstorming maiden victory recorded by Miss Matriarch at Pakenham on Thursday evening. The breakthrough came at start number ten for the daughter of Street Boss (also sire of our Newmarket Handicap winner The Quarterback) who spent her first nine outings figuring out the great puzzle that is racing! "She has just taken a while but she has run some really nice races, she always hits the line well," Matthews said. A little disappointing at her previous run at the mile, Miss Matriarch was patiently steered back to 1400m by EthanBrown who was happy to let the three-year-old find her feet out the back. "When they bunched up and I was able to get pulled wide on the back of the favourite my confidence soared," Brown said, impressed by the feel Miss Matriarch gave him though he thinks that there is still scope for further improvement. "She is a nice horse but she did want to have a look around a bit once she hit the front." Bred in Victoria by Larneuk Stud, Miss Matriarch made her way through the sales ring on two occasions, firstly as a weanling in Melbourne and then as a yearling at the Gold Coast Magic Millions. She is the sixth winner for the very good broodmare Grand Manners, also dam of the stakes placed city winners Lalla Rookh (third in the Gr.1 South Australian Derby) and Waratone (second in the Gr.2 Adelaide Cup). 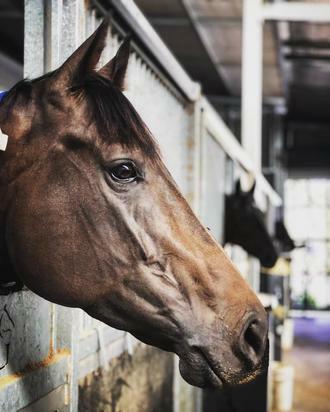 Served last spring by O'Lonhro having foaled a Wolf Cry filly last spring, Grand Manners is a half-sister to the two times Group winner Great Delight from the family of high class Hong Kong based sprinter Amber Sky.